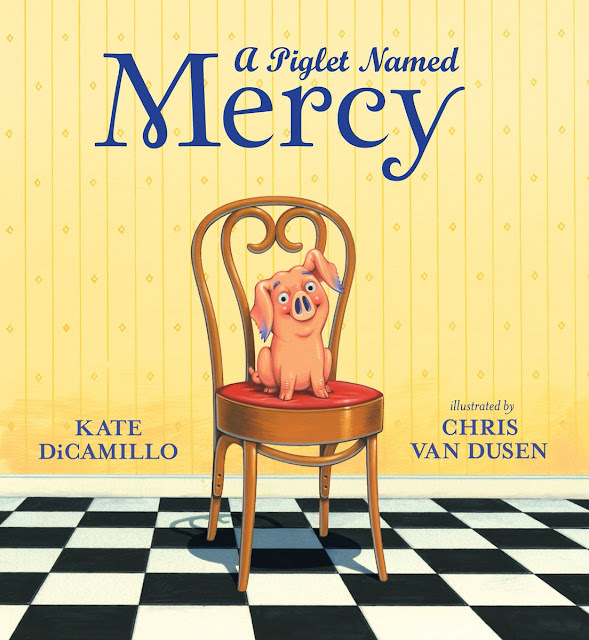 Hello, Kelly DiPucchio and LeUyen Pham! Thank you for visiting Watch. Connect. Read. to celebrate Grace Goes to Washington, a companion to Grace for President! What was the most exciting / fun / terrifying thing about returning to Grace’s world? 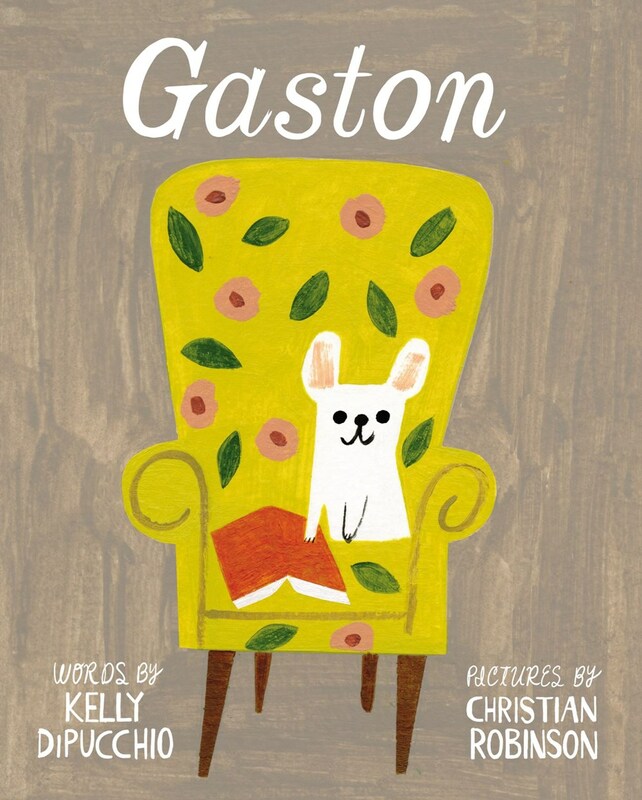 Kelly DiPucchio: Thank you for the invitation, John! And thank you for being a special part of Grace’s world from the very beginning. Writing a follow-up to Grace for President truly was all of the things you mentioned: exciting, fun, and terrifying! I knew the bar was going to be set really high and I felt a tremendous amount of pressure to not disappoint Grace’s amazing supporters. At the same time, I felt our country was ready for a sequel and I was beyond excited to create another story for this character who has taken on a life of her own since the first book was published in 2008. Over the years I have met thousands of kids who have been inspired by Grace Campbell’s determination and spirit. I met countless little girls across the country who were eager to tell me they were going to grow up to be president one day. And I heard from scores of parents and teachers and women who said the book moved them to tears. So, I was very excited for the opportunity to reach a whole new batch of readers with a second story. It was also exceedingly fun to have another chance to collaborate with LeUyen again. I have so much respect for her as an artist and a human being. 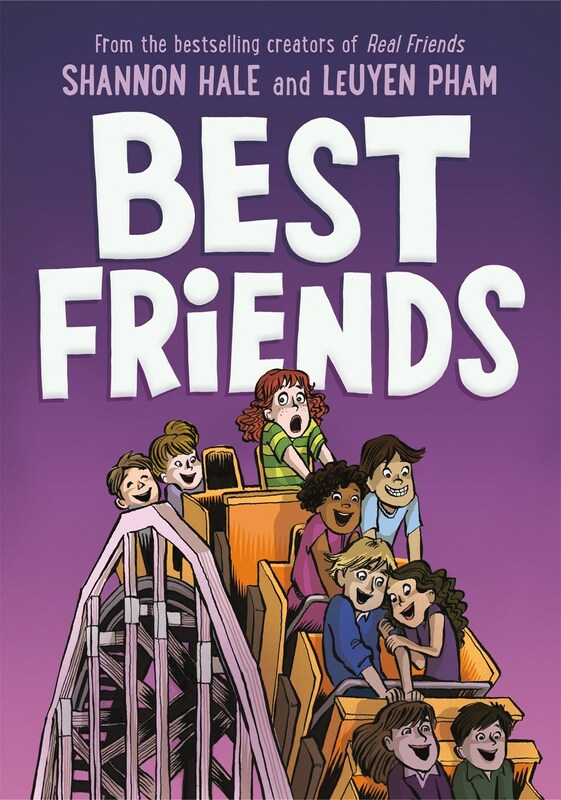 I’m very proud of the new book we made and I am grateful to our editor, Rotem Moscovich, at Disney-Hyperion for her enthusiasm, guidance and support along the way. LeUyen: It’s been ten years since the first book came out, and when I think back, ten years ago seemed like such a hopeful time. I feel like Grace was a part of that movement for me, a time when I was proud of our government, and wanting change. Working on Grace at that time embodied a lot of that feeling, she’s just such a natural conduit for hope. So to return to her now, during a time when so many people are disgruntled with our political environment, and are in need of unity, is cathartic for me. Believe it or not, Kelly and I hadn’t met ever until early last year, when we finally were at a conference together. I had been hoping to convince Kelly to write another Grace book, as I truly felt like it was needed right now. And lo and behold, Kelly told me she’d been thinking of a new book all along! It was kismet, I tell you. Kelly, how can young people become involved citizens and make a difference? LeUyen, please tell us about the beautiful Friendship Mall you designed for Grace Goes to Washington. LeUyen: It’s funny, but Kelly’s original script had called for a Friend Ship, an actual ship playground structure that you see in parks everywhere. That was one thing I’d asked her to consider changing, to sort of tie the story together, and to bring it back to Washington D.C. with the introduction of an obelisk dedicated to friendship instead of a ship. I rarely have ideas that I ever offer up to authors, I’m usually pretty timid with anything like that. So I’m really honored that Kelly took the suggestion. Designing it was fun. The central obelisk represents friendship, and the park benches around it have the words “kind”, “love”, “share”, “give”, tenets that are all central to friendship, that school children are taught everyday, and that our political leaders could use a lesson in. Everything in this book is meant to be positive, to move us to positive action. LeUyen Pham’s illustrations are uplifting, diverse, fun and full of heart. I think everyone would have to agree that any artist who can bring life and warmth to stories about the electoral college and the three branches of government in engaging, thoughtful ways is pretty magical! Grace is the face of so many little girls who deserve to see themselves in books that are empowering and feature confident, independent, strong female characters. 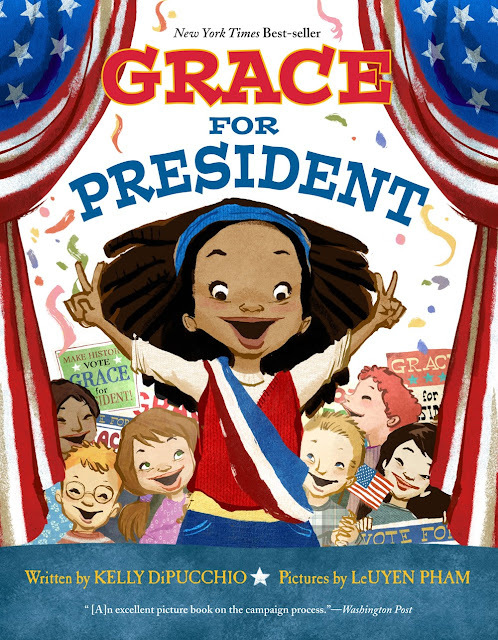 I hope Grace Goes to Washington inspires kids to lead with kindness and to build a future where unity and altruism are the models for success. Grace Goes to Washington’s endpapers were designed in my head from my first conversation with Kelly about doing a sequel to Grace. The first book had been about explaining how the electoral college works, and how the system, when not abused, serves the will of the people. For the second book, the idea of separation of powers was central to me. I really want kids to understand that the president is not an all-powerful being, but one of three powerful branches that keep our government and our country in check. Balancing those powers is necessary. If nothing else, I want kids to be able to look at the endpages and really understand that. Picture books are the most amazing ways to connect people ever. They tell stories, they amuse, they make you feel good, or bad, they teach… I’m so incredibly lucky that my job is to make them. It connects me to so many people out there. Instead of tweeting or posting online, my social media are the books I make! Mr. Schu, you should have asked me whether I’d ever run for office. No, I wouldn’t like to run, but as student at UCLA I took a couple classes on government and the U.S. Constitution, and I love that I get to live through Grace a little to share some of that knowledge. The Constitution is an amazing document! I wonder if there’d be any interest in making a graphic novel about it? 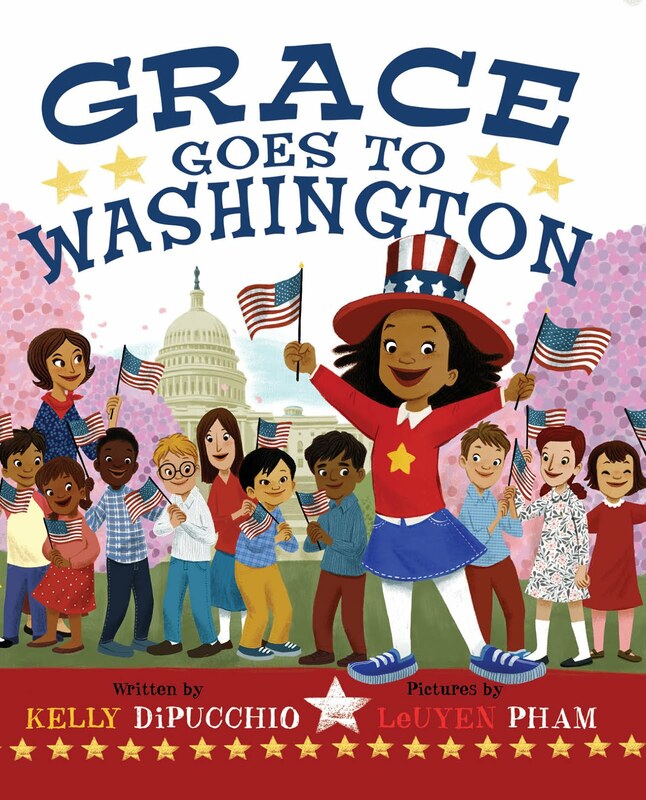 Look for Grace Goes to Washington on September 3, 2019.